People in the manufacturing industry may be called on to operate heavy equipment. In the wrong hands, this could create a dangerous environment, which makes it crucial to hire qualified people who respect and follow essential safety standards. Backgrounds Online provides employment and reference verifications, plus comprehensive drug screening services. We'll help you make the best choices when looking for clear-headed people who help create a safe working atmosphere for everyone. When hiring for manufacturing positions, you are probably inclined to move as quickly as possible. There are a limited number of eligible workers available, so you'll be eager to make offers and attract top talent before they accept positions elsewhere. Backgrounds Online is your partner in this process. We offer fast turnaround times and services such as Applicant Self-Submittal, which allows your candidates to submit their own background check and facilitate the screening process. When you bring someone on board, they go through a training period that is costly, but essential. You'll spend time and money preparing new hires for a long-term future in your company. Before you extend any offer, let us help with your due diligence by verifying the applicant's identity, checking their employment history and searching for criminal records. A background check is a small, worthwhile investment that saves you money and protects your business. Did you know that it is essential to only use FCRA compliant background screening practices while making hiring decisions? You cannot legally screen manufacturing candidates on your own by checking them online or reviewing their social profiles. Backgrounds Online is certified by the FCRA and accredited by the NAPBS. As a Consumer Reporting Agency, we are fully authorized to run employment background checks and issue reports that help you make hiring choices. We'll ensure you remain compliant with federal and local laws that cover the manufacturing industry. We've had trouble finding qualified, reliable employees. How can Backgrounds Online help? A: We provide comprehensive background checks that help you determine if a candidate is properly trained for a position, and show you the applicant's work history. 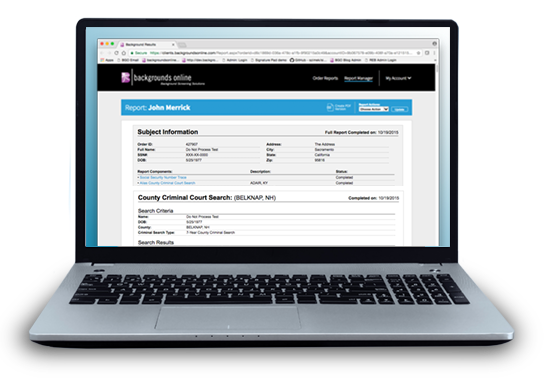 You can use our FCRA compliant reports to get a thorough overview of the person's past. This is a good indicator about their reliability for future projects. You'll see each applicant's work history, including how long they stayed at previous jobs. We also provide Employment Verifications, which give you insight into how the person was perceived by previous employers. Are you able to verify licenses and credentials for my applicants? A: Yes, we provide License and Credential Verification services. We'll determine whether or not the person has proper licensing for any position, and present that information clearly in your report. Do I need background checks for administrative personnel? A: We recommend background checks for every potential employee. A background check provides a wealth of information for any candidate. Our reports include identity verification, criminal records checks, and other important features. They can be tailored for every type of position. Sign up with Backgrounds Online to create custom screening packages that can be used every time you are hiring. Run background checks before extending any offers to ensure you keep your business fully compliant with all federal and state regulations. What screening services do you offer for employees who will drive large vehicles on the job? A: Backgrounds Online offers a variety of screening solutions. We have pre-set package that includes a Motor Vehicle Record Search or you can create a Custom Background Check package that provides information about the person's license type, driving history and other useful facts. If you have questions on how to develop a screening package for your hiring needs, please contact us. I need to screen multiple people. How can you help make the process faster? A: Our website makes it easy to create and save Custom Background Check packages. You can use these packages to screen applicants for similar positions at any time. We also offer Applicant Self-Submittal, a feature that allows the applicant to submit their own information to run a background check. This saves you time and helps prevent errors. There are many jobs available in the Manufacturing industry. The screening package you require can vary by position. We'll help you find the right one for all of your hiring needs.